I came across this photograph on page 35 of the May, 1904, issue of Ohio Architect and Builder. 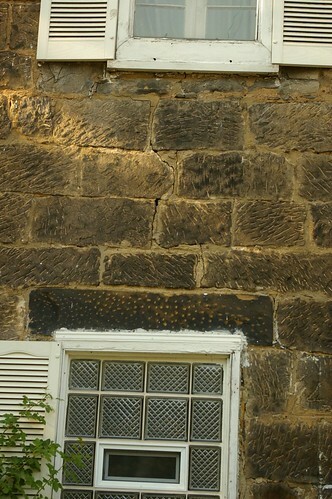 It bears the simple caption "How an old country place at Rocky River was fitted up". This sounds like a story to me. An old farm house, done to look contemporary, perhaps? Do you recognize this house? If so, I'd love to know where it is - it'd make the research a lot easier. The Cleveland Play House, on Euclid at East 85th Street, is the only building in Cleveland area designed Philip Johnson (1906-2005). A native of Cleveland, Johnson is best known for his 1949 Glass House, a National Historic Landmark, in New Canaan, Connecticut. The Cleveland Clinic has purchased the Cleveland Play House and surrounding land for $13 million, as reported by the Plain Dealer. The Play House and MOCA Cleveland will be vacating the space in late 2011 or summer of 2012. While the Cleveland Clinic has not yet stated its plans for the space, but it seems likely that they will demolish the building, including the 1983 addition designed by Johnson. They haven't shown any interest in historic preservation in the past, and it seems unlikely that they will start now. As Steven Litt pointed out, two thirds of the land involved in the purchase is not occupied by the Play House. This land could be used for whatever the Clinic plans for the site without obliterating this landmark building. Surely the Clinic could find some use for the Cleveland Play House buildings - perhaps as a conference center? The Plain Dealer reported Clinic spokesman Eileen Sheil saying "Over the next several months, we'll study the options and see what's possible and make the best decision for the Cleveland Clinic, keeping in mind the interests of the community." I would like to believe that the Cleveland Clinic will actually consider the interests of the community, but their past performance hasn't given me any reason to hope that this will actually happen. We need to let them know that this is an important part of the Cleveland landscape, and that we will not accept its destruction. I will be running a photo essay on the Cleveland Play House in the near future. I would like to include some interior photographs. If you have any and are willing to let us use them, please comment here or email ClevelandAreaHistory@gmail.com. 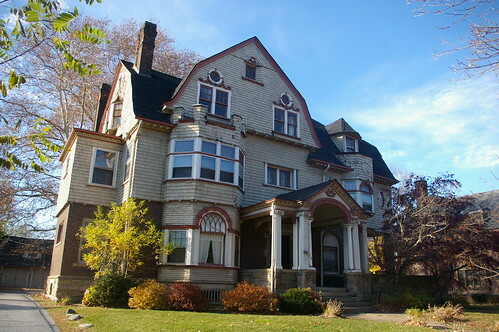 In my discussion of the Rodolphus Edwards house the other day, I compared it with the John Honam house, in Lakewood. 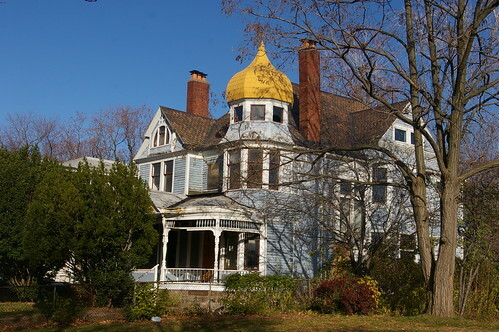 There's another similar house, worthy of mention, that slipped my mind, the Preyer house, at 14299 Superior Road, in Cleveland Heights, Ohio. From the street, the Preyer house doesn't look anything like the other two houses mentioned. The siting of the house, so far back from the street, when compared with the other houses in the neighborhood, should be a clue that something is different about the house. 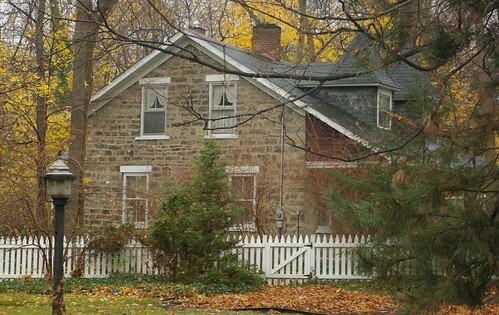 A closer view allows us to see that the house is made of sandstone, but it still looks like one built around the turn of the century. This is fitting, as this was when the house was expanded considerably. 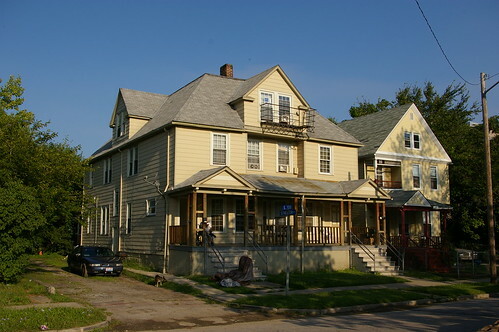 The dormers, porch, and rear wing were added at the time. 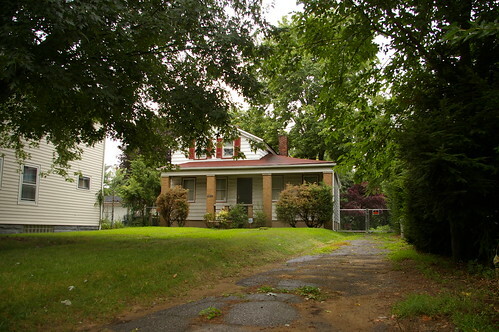 This side view reveals a very different house, one similar to the Edwards house. 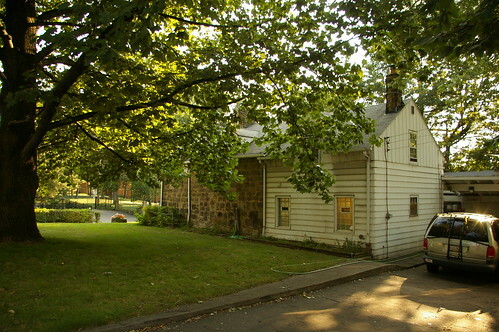 The Preyer house, built c. 1825, is a Cleveland Heights landmark. It is the oldest house in the city. The style of this house makes me wonder if the Edwards house might, in fact, be a bit earlier than I had suspected. I've driven by this house, at 10701 Buckeye Road, in Cleveland, Ohio, any number of times, but it wasn't until a couple months ago that I really looked at it. At 30 miles an hour, it looks like a late 19th century house. I wondered if it might be earlier, but the proportions didn't seem right - the pitch of the roof, most notably. I now realize that this is one of the most significant houses standing in the area. At a slower pace, you can see the tool marks in the stone. Note the wide variety of marks. You don't see this in later houses, once it was possible to mechanically smooth stone. There must have been a nearby quarry, which seems to have supplied the owners of this house enough material for both the wall and the garage. I suspect the aluminum-sided wing to the rear is newer than the sandstone wing. The small chimney suggests the structure as a kitchen, added later.The vertical siding begins at about the same point as the trim boards on this Greek Revival, so perhaps the installer did this to work with the existing siding. The builder managed to keep the proportions almost identical between the two halves. 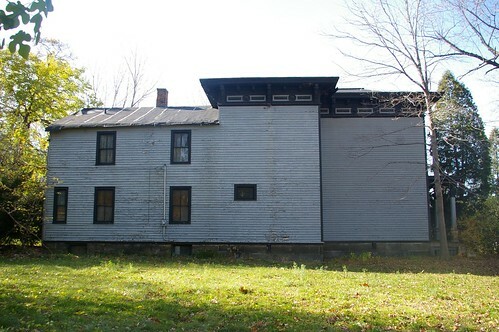 The east side of the house shows evidence of a first floor window, centered on the wall, which has since been filled in. The dormers are a later addition. 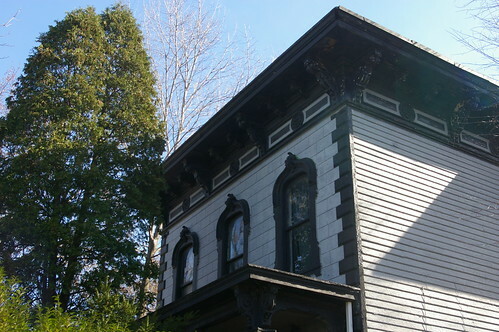 The galvanized finials on the dormers and the main roof are a nice detail. It's too bad that the first floor windows have been filled in with glass block. The photograph in Mary-Peale Schofield's Landmark Architecture of Cleveland, published in 1976 shows the house with first floor windows that match those on the second floor. The windows appear to be bi-fold. Security bars are a more reversible option than glass block. I've seen custom wrought iron ones that would detract less from the appearance of the house. The original appearance of the west side of the house is unclear. It was probably the entrance - we don't have evidence of an entrance on the other side or on the front. The entrance would likely have had some sort of ornamentation, probably sidelights, if keeping with the style of the period. Perhaps these details are still present, hidden under the awning. It is difficult to provide an exact date for this house. The 1858 Hopkins Map of Cuyahoga County, Ohio, should show the house. It illustrates the property of one R. Edwards, 18.51 acres, at the northeast corner of the intersection of the two major roads, now Buckeye and Woodhill. The Edwards house should be where the .51 is on the map. It is provided courtesy of Rails and Trails. 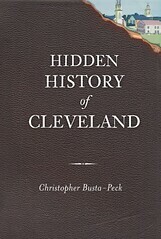 Another version is available from Cleveland Public Library. 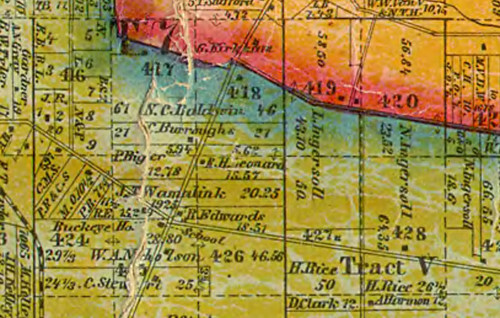 The 1874 Atlas of Cuyahoga County, Ohio shows the same property as the 1858 Hopkins map, still belonging to R. Edwards. 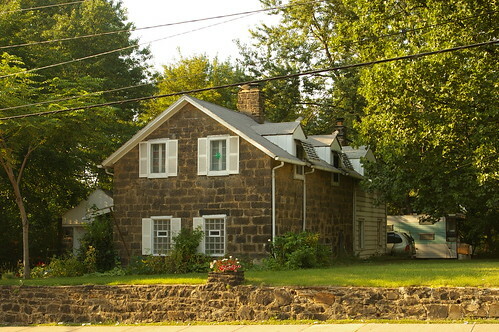 The house is shown in the proper location, on the map of Newburgh Township. Rodolphus Edwards' father had the same first name. They were not commonly referred to as junior and senior. Further, he was one of the original surveyors of the Western Reserve. 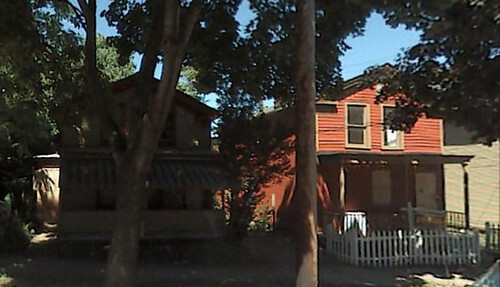 He built a very popular tavern, which is the building shown on the map in the Edwards property. He had considerable property holdings in the greater Cleveland area. This all makes him a far more prominent individual and makes it harder to learn about Rodolphus, Jr. The following is my best guess. In April, 1836, Hanna and Starks Edwards transferred property to Rodolphus Edwards, parts of lots 424, 425, and 426 (AFN 183605040001). The map shown above shows holdings by Rodolphus Edwards in lots 425 and 426 - I'm confident that this was the property transferred by Hanna and Starks. Further, I'm reasonably confident that the property was being transferred to the junior Rodolphus because it seems unlikely that the senior would be reacquiring property he had given to his son at that late stage in his life. Further, it seems likely that Rodolphus (sometimes spelled Rudolphus) would have begun work on this residence shortly after purchase of the land. He would have been 18 years old at the time. The manner of the stone masonry provides further evidence of the date - it is more primitive than what I've seen in houses in the area from the 1850s. This narrows the date range. We can be sure that the house was built before about 1855, and reasonably confident before 1845. I want to say it was built in 1836 - but I need more evidence, either physical or documentary. It is plausible, but unlikely, that the house was built before 1836. The issue of dating the Rodolphus Edwards houses isn't made any easier by this exceprt from the Annals of the Early Settlers Association, no. 4, p. 47. It states that Edwards was living in the old tavern, which was at the northeast corner of what is now Woodhill and Buckeye. Rodolphus Edwards, for short called "Dolph," and of whom I am about to write, can be numbered among the early pioneers of Cuyahoga county, having come here away back in 1797. He settled on a large tract of land now known as Woodland Hills, but formerly called Butternut Ridge. In addition to farming he kept a public inn or tavern, as they were called in those days, for the accommodation of the traveling public, which was a place of resort for the old pioneers who used occasionally to meet and over their glasses of cider-flip pass away the time recounting their trials and adventures of pioneer life. 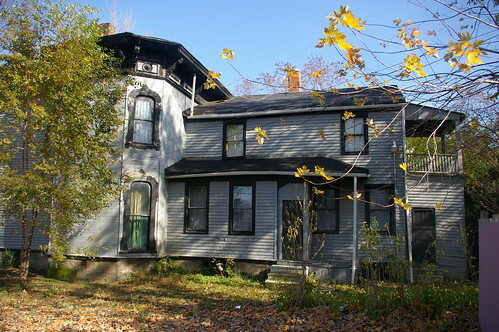 This old house is still standing, having been converted into a private residence, and is now occupied by Rodolphus Edwards, Jr., who himself is well advanced in years. I've tried to learn who Rodolphus Edwards, Jr., was, with little success. One can assume that, like almost all of the settlers living this far outside the city at the time, he was a farmer. The Annals of the Early Settlers Association, no. 11, p. 465-466 provides the following memorial, which ends up being more of a biography of his father. Rodolphus Edwards, whose death occurred at his home on Woodland Hills, on Thursday, August 21, 1890, was a son of Rodolphus Edwards. The latter was a member of the surveying party in the Western Reserve in 1798, in which year he arrived at Cleveland, together with Nathaniel Dan, wife, one son and three daughters, Samuel Dodge, father of the late Henry Dodge, Nathan Chapman, Stephen Gilbert and Joseph Landon. These eleven persons were the total permanent additions to the population of Cleveland during the year 1798. Mr. Edwards had followed surveying previous to coming here, and the compass used by him from 1792 to 1798 may be seen in the rooms of the Historical Society, to which it was donated by Mr. Edwards, recently deceased. Mr. Edwards, Sr., the first year he was in Cleveland built a log cabin "under the hill" at the foot of Superior street. He remained there, however, but a short time, and on account of the malaria at the mouth of the Cuyahoga, removed in a year or two, with two or three other families, to the high land running from Doan's Corners to Newburg. He appears to have been a man of much intelligence and great good sense and judgment, and was very useful in the early days of the Reserve. 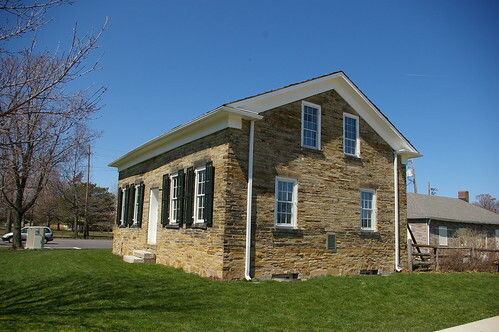 He was chairman of the first town meeting held in Cleveland, April 5, 1802, at the house of James Kingsbury. Mr. Edwards came here from Chenango county, New York, but the family is of Connecticut origin, the father of Rodolphus, Sr., having been born in Tolland county, that State, in 1739. Later he also came to Cleveland, and died at the house of his son, in 1831, aged ninety-two years. His name was Adoinjah. He was in the war of the Revolution under General Stark, who as he drew his forces up to attack Burgoyne, said to his men: "Fellow-soldiers, there is the enemy. If we do not take them Molly Stark will be a widow to-night." Rodolphus Edwards, Sr., heard from the lips of his father much of the history of that great war for the independence of this country, as well as the part taken in it by his father, and in memory of the gallant and brave general under whom his father served, named his first son Stark, who was born December 6, 1808, and died June 19, 1877. Rodolphus, Jr., was born July 15, 1818. He had a sister, Sally, who married Patrick Thomas, son of William Thomas, who was an uncle of Major-General George H. Thomas. The branch of the Edwards family from which Mr. Edwards was descended was of much prominence in Connecticut, and gave to that State and country many distinguished names. Among them may be mentioned Jonathan, who graduated at Yale College in 1720, and who became president of Nassau Hall College, and is mentioned as one of the most celebrated and orthodox divines in New England. The latter's son, Jonathan, was president of Union College, at Schenectady, and noted for great reasoning power and strength of mind. Rodolphus Edwards was a member of the Early Settlers' Association, and took great satisfaction in talking of the early days of Cleveland. He was well known in the ea'sterly part of the city, and had the respect and esteem of the community through a long and active life. His father bought a tract of land on what is now known as Woodland Hills, and kept a hotel there for many years. A large part of this property yet remains in the possession of the family, and here, on the old homestead, the son died, Thursday last, aged seventy-two years. 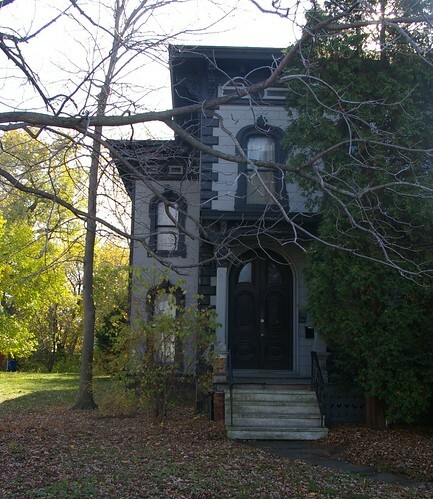 To help make sense of the Rodolphus Edwards house, I looked for one to compare it to. The John Honam residence, built c. 1838, came to mind. 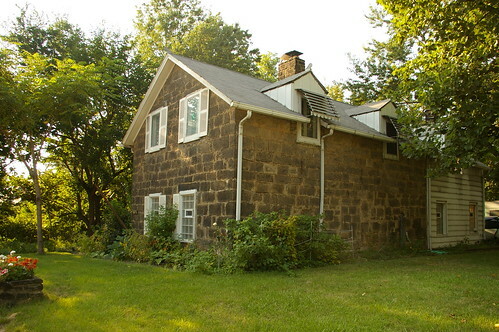 The house, now a museum in Lakewood Park, is also known as the Oldest Stone House. 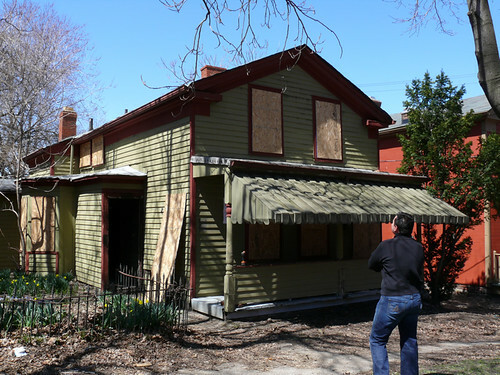 It was originally located at 1369 St. Charles Avenue, in Lakewood. Prior to the move, it was documented by the Historic American Buildings Survey (HABS). 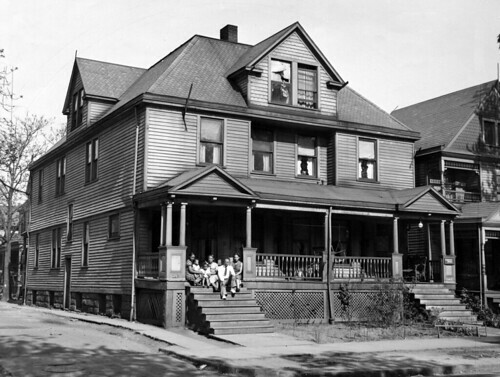 The Cleveland Memory project also has several historic photos of the house. Both houses are about the same size, made from the same materials, and were built at about the same time. The windows on the front of the Honam house are not original, but the ones on the sides are. 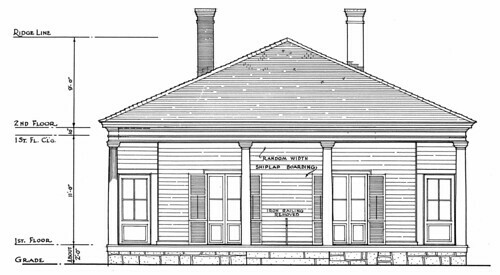 The HABS drawings suggest that the front and back of the Honam house were originally three bays wide, giving it similar proportions to the Edwards house. 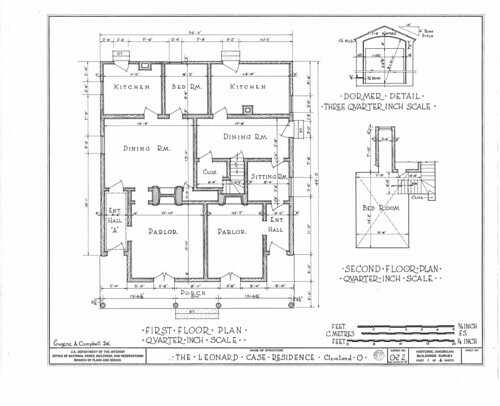 The floorplan of the Edwards house is probably similar to the one provided in the HABS drawings for the Honam house. The most obvious difference between the two houses is the level and quality of detail. 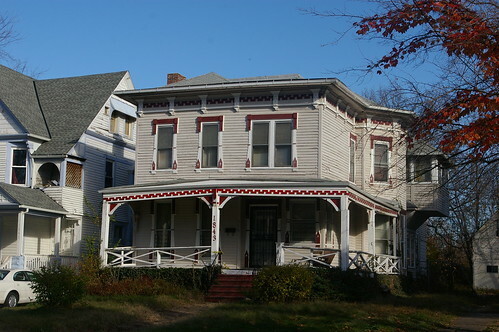 The Honam house has detailed gables, nicely trimmed, while the Edwards house has simple ones. For the Honam residence, the stones were cut into smaller, more regular blocks, while for Edwards, they remain more rough, and with obvious tool marks. There was a quarry close to the Honam residence, on what is now Cook Avenue, just a couple hundred feet away. The closest quarry to the Edwards residence that I've been able to locate on a map was on what is now Kinsman Road, about a mile away. Of course, a quarry might have been closer and simply not be on the map. Edwards and Honam were both farmers, seemingly concerned with building houses that were either more durable or that conveyed a sense of greater importance. Perhaps Honam had more time to build his residence. Perhaps he was simply more skilled. This house is a critical piece of our local history. There are very few houses in the area that are this old in any condition. Combine this with the relatively unmolested nature of the structure and we have a building that simply can't be ignored. The current owners seem to be taking good care of the house. They also own several adjacent lots, which total about a half acre. If there was ever the inclination to make this house into a museum or to bring the property back to the original rural nature, this would be helpful. 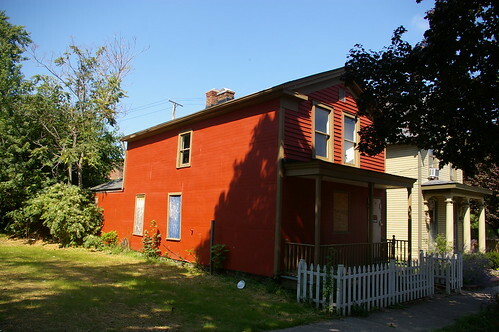 There is absolutely no reason that this house should not be considered for Cleveland Landmark status. 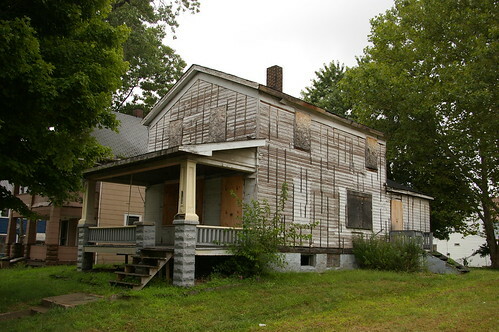 With the appropriate documentation, it would be easy to get it into the National Register of Historic Places. 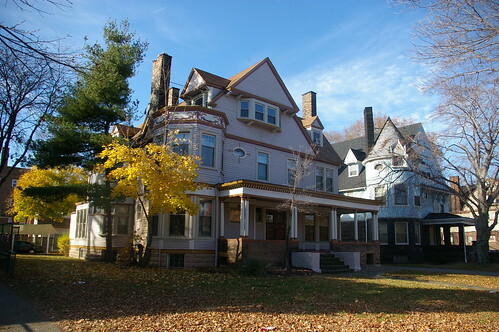 East 89th Street in Cleveland, between Chester and Hough, is a National Register of Historic Places District as well as a Cleveland Landmark District. It includes many grand old houses, including this one at 1834 E. 89. Here are most, though not all, of the houses in the district. The photos are in order - first we have the west side of the street, from north to south, then the east side, from south to north. 1856 East 89th Street. I appreciate the work that they've put into painting the trim on this house, especially the details on the tower. I can only imagine how much time it must have taken to paint the dentil moulding around the porch. Note the similar wreath theme on the front doors. The state of the chimney is a bit of a concern - hopefully it will be addressed soon. I wish I could have seen the house before the windows were replaced. The rear tower appears to retain a few original leaded glass windows. 1848 East 89th Street. It's so nice to a house with built with dark sandstone that hasn't been painted "to brighten it up". Note the buttresses near the back, which help, if only visually, to hold up the massive shape. The sandstone in the chimney helps, visually, to tie the house together - it wouldn't be the same if the sandstone on the first floor had been painted. I'm curious as to the configuration of the windows on the rear gable. I also wonder what the uppermost one in the tower used to look like. 1834 East 89th Street. The level of detail in this house is truly impressive. Take a minute and look at the larger version of the photograph. 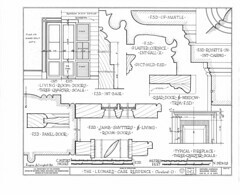 I like the repetition of shapes in the arch over the first floor bay window, the front entryway, and the bay window on the second floor. I'd say more, but the house tells the story itself better than I can. 1822 East 89th Street. 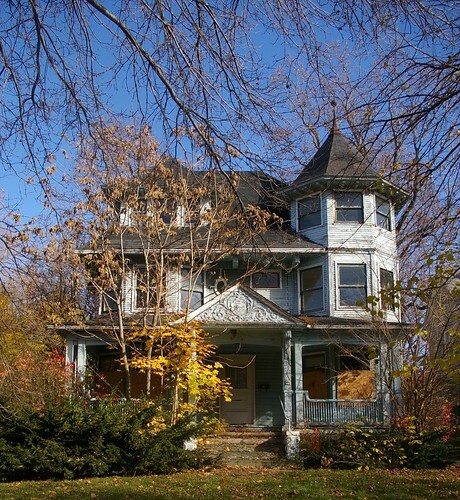 This house, built in 1901 for Dr. James Bell, was designed by architect George Hardway. 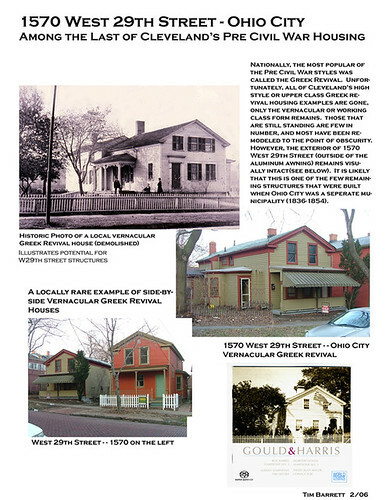 It is individually listed in the National Register of Historic Places for the merits of its architecture. It is also a Cleveland landmark. 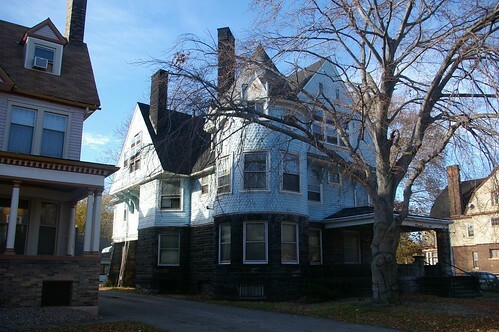 The Cleveland Restoration Society uses this house as the example of Romanesque Revival in the publication Architecture Styles Found in Northeast Ohio. I'd assume that the windows were originally double hung, 6 over 6, though they might have been 6 over 1. 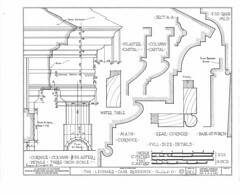 The original configuration of the front porch is a more difficult question. My best guess is that there was originally some sort of canvas awning on the left side of the porch. 1814 East 89th Street. 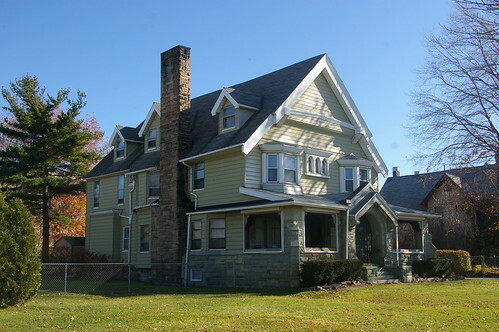 This house is an excellent example of early 20th century Colonial Revival. The present state of the chimney makes me wonder whether that was the original height, or if the row of sandstone that we see now was a ring of trim where it either broke off or was disassembled to. 1796 East 89th Street. 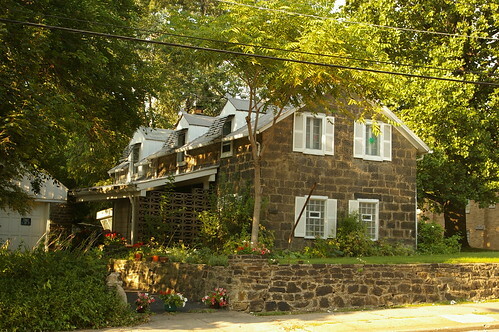 Try to imagine the first floor of this house with the same color sandstone that is visible in the chimney. The windows stuck out a bit more before the vinyl siding was added, but they've been trimmed decently. Based on the small spot on the side of the house where the siding is slipping off, it seems that the house is covered with shingles. 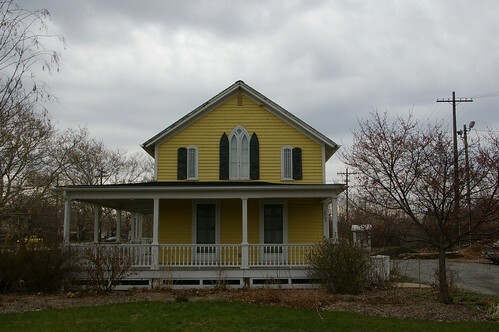 The two columns on the edges of the porch probably used to match the two in the center. 1809 East 89th Street. 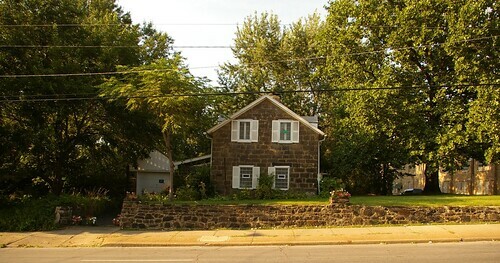 This house and the couple that follow are on the east side of the street. While the detail over the entryway is a bit busy, the rest of it is relatively understated. Note the beautiful lines of the porch railings and the slight arch above them, for instance. This house does not appear to currently be used as a residence. It is owned by one Melvin Pye of 99 Nantucket Court, Bratenahl, Ohio. He has not paid property taxes on it since 2006. He also owns several other properties in the area. 1843 East 89th Street. I really like the level of detail in the trim on this Italianate style house and the care that the owners have put into painting it. These houses normally have much simpler trim and it's a pain in the neck to paint all that detail. 1849 East 89th Street. 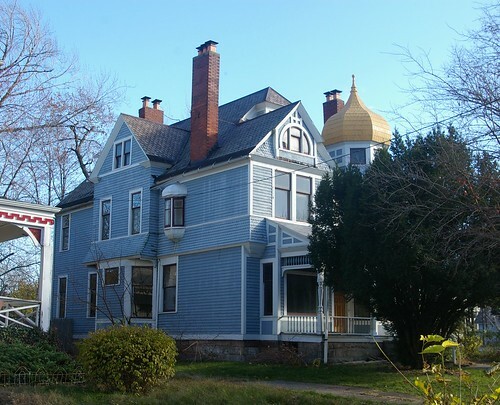 This Queen Anne style house has a wonderful presence. You might notice that instead of slate, the bottom edge of the roof is tarpaper. 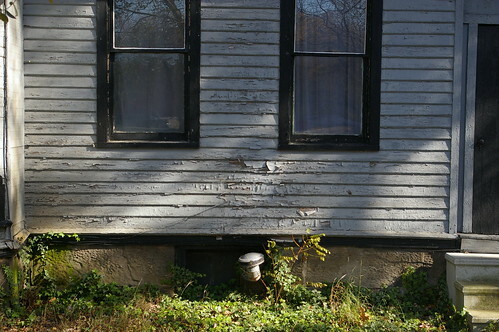 This house was probably built with a "Yankee gutter". A Yankee gutter is formed by installing a board, 4-6 inches wide, perpendicular to the sheathing of the roof. It is lined with copper and functions much the same way as the gutters we use now. In this case, it was probably removed when the copper eventually rusted away. Note the second floor windows that appear to be glazed with curved glass - I'd hate to think about dealing with one of those if it broke. A little while ago, this photograph, from the Cleveland Press Collection, part of the Special Collections at Cleveland State University came to my attention. The image, taken in 1935, shows the athlete Jesse Owens seated in front of his house. The photograph was presumably taken for a newspaper story detailing the Big Ten track meet in Michigan in which Owens beat three world records and tied a fourth in the space of 45 minutes. Owens would go on to win four gold medals at the 1936 Berlin Olympics. 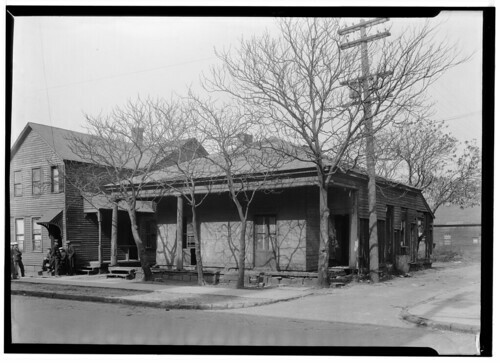 I asked the Cleveland State University Special Collections librarian Bill Barrow if he might send me a higher resolution version of the file to help me identify the location of the house. Perhaps a half hour or 45 minutes later, I received an email from Mr. Barrow with an address - 2178 East 100th Street - the house was still standing. The next morning, I stopped by on the way to work to see the house for myself. It is presently occupied, as a rental property. 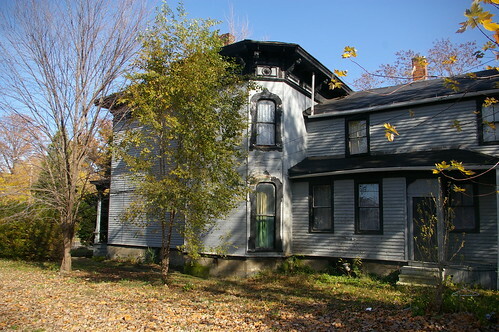 It has suffered the indignity of vinyl replacement windows and vinyl siding, but otherwise remains in solid condition. 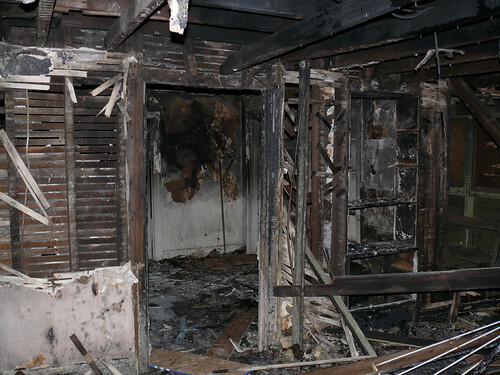 The condition of the interior is unknown. I had Michael Ruffing, a librarian in the History and Geography department of Cleveland Public Library check the city directories, to see if we could figure out how long Owens lived at that address. The directories show him at this address from 1934-1936 - the most important years of his Cleveland residency. 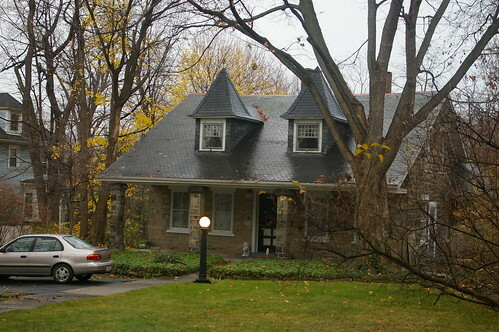 The house is one of five houses in the neighbhorhood owned by one John Cummings, a resident of 2214 East 100th Street. These are presumably rental properties. Mr. Cummings long term plans for the properties are not known. The threat to this house is the continued expansion of the Cleveland Clinic. The Clinic has shown their feelings for historic preservation quite clearly in the demolition of the Art Deco Ohio College of Podiatric Medicine building to make way for surface parking. A medium-sized building is under construction just across the street from the Jesse Owens house. It is only a matter of time before this house is put on the Clinic's demolition list. 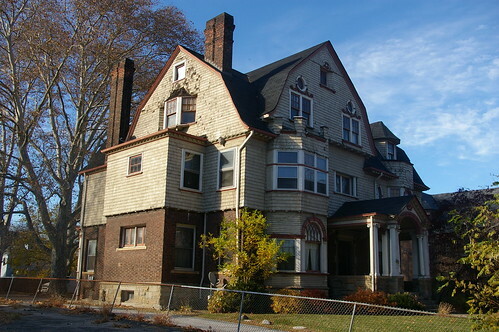 This house should be a Cleveland landmark - it was the residence, at the height of his career, of one the most important athletes to ever come from this city. If the interior remains relatively original, it might be worth considering for National Historic Landmark status. There are two other addresses associated with Jesse Owens in Cleveland, per the city directories - 2020 Hamilton Avenue, from 1924 to 1926, and 2212 East 90th Street, from 1927-1929. The 1930 Federal Census also places Owens at the East 90th Street address. There are no listings for the Owens family in the city directories from 1930-1933. Michael Ruffing, a librarian in the History and Geography department at Cleveland Public Library provided this information. The structure at 2020 Hamilton Avenue is no longer standing. I do not know whether it was a house, apartment building, or perhaps an apartment over a store. 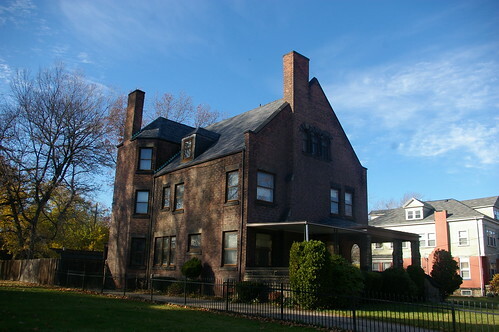 The Owens residence from 1927-1930, 2212 East 90th Street, is still standing. While a nice house, in good condition, it was not from as important a time in Owens' life. 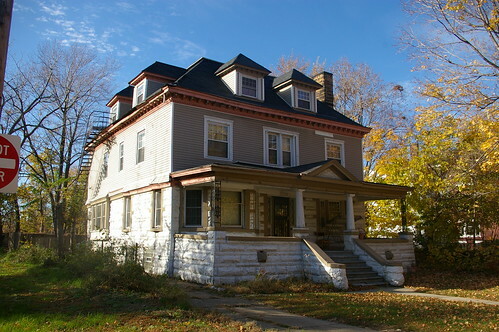 There was a nice article on Cleveland.com today about the Fairfax Renaissance Development Corporation's possible plans to rehab the Langston Hughes residence at 2266 East 86th Street. I'm only mentioned as "a local librarian", but that's fine with me - I'm just glad to see that the house won't be demolished. 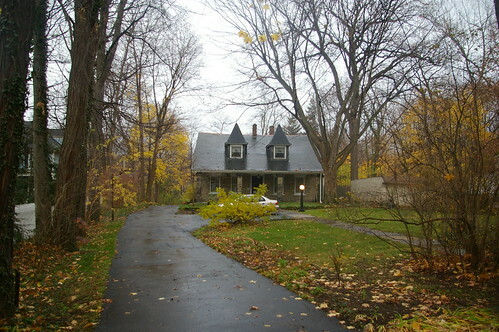 I've posted a set of lots of photos of the Langston Hughes House at 2266 E. 86th St. if you want to see it in more detail. I came across this Italianate house at 6512 Superior Avenue, in Cleveland, Ohio, while on the search for Greek Revival houses, as part of my ongoing project to document all the remaining ones within the city of Cleveland. The Pictometry Bird's Eye View of the house was promising - the proportions of the roof on the rear wing of the house looked just right. 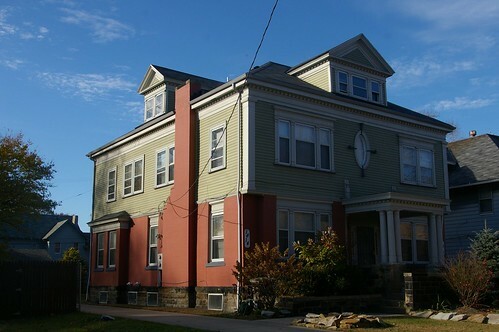 Further, I've seen several houses where an Italianate addition was built in front of an earlier Greek Revival structure - the funeral home at the corner of E. 89 and Cedar is a good example. The Cozad-Bates house is another. The overall quality of this house, from what can bee seen on the exterior, is excellent. Note the trompe l'oeil painting of stone. Someone has clearly put a lot of energy into this house, up until recently. The aerial view suggested that there were two similar houses at this location. Alas, when I arrived, I found that the one next door had been demolished. The house has a very nice presence on the lot. Note the impressive columns on the front porch and the complex mouldings around the windows. One could gain a lot of curb appeal by just pruning the trees, so that the house could be seen better from the street. The front door is equally interesting. 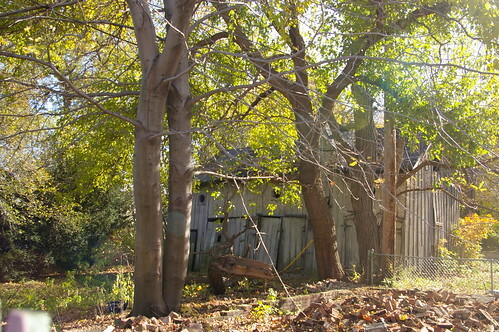 This view of the east side of the house shows the transition between the older and newer structures. That the style of the foundation on the older part seems to extend over into the Italianate part suggests that perhaps part of the front of the older part was removed when the house was expanded. 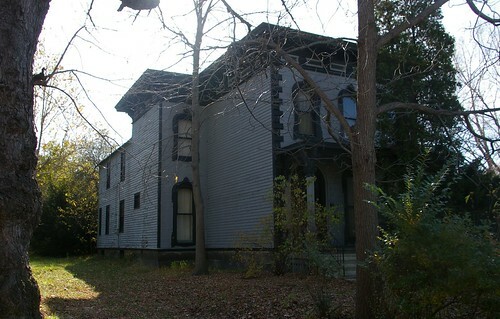 The west side of the house, shown here, presents a more clear break between the two wings. The foundation changes abruptly between the two halves, probably because of the shape of the Italianate part. The house is also notable in that the original barn is still standing, even if only just so. There are very few houses in the city for which this is true. 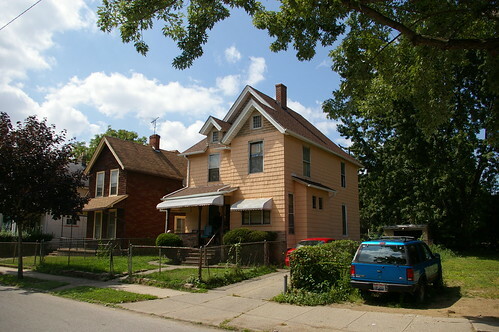 Those Wonderful Old Houses suggests that there are a few, but that pubication focuses on Ohio City, where much more of the history landscape has been preserved. The biggest problem I have with calling the older part of the house a Greek Revival are the size and proportions of the windows. 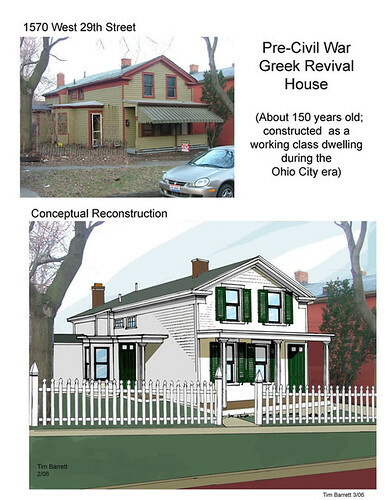 For a Greek Revival, I would have expected smaller, skinnier windows. Of course, the windows could easily have been replaced at sometime in the past - perhaps at the same time as the house was expanded. I have a hard time placing an exact date on this house. The tooling of the stone used for the foundation on the older part of the house is consistent with what I've seen used in houses dating from the 1830s-1850s. It would seem reasonable for the older part of the house to fall in that date range. 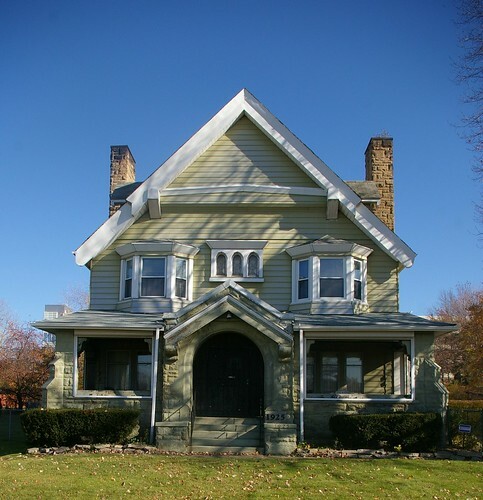 The Italianate style, used for the main part of the house, was popular from the 1840s through 1880s. I'm not familar enough with the style to provide a more precise date than that. I consulted the Hopkins 1881 Atlas of Cleveland, which illustrates the location of each individual house. This house was not included. I'm beginning to doubt the completeness of that atlas, as there are several houses I've come across recently that I would have expected to be included but which are not. According to the County Auditor, the house is 3400 square feet, on a lot measuring 8850 square feet. 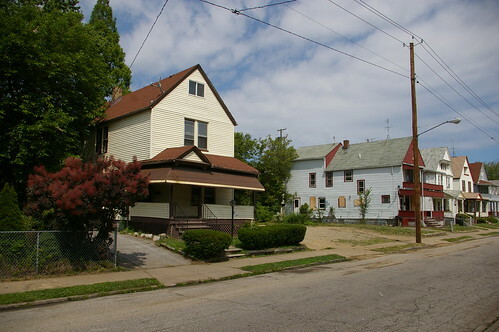 The two lots to the west, totalling 9252 square feet, are both owned by the City of Cleveland, and would be available for purchase at a trivial price by any owner of this property. In addition, the owner of the lot immediately to the east of this house would probably be willing to sell it. If not, it will eventually be taken for back taxes, which have not been paid since 2006. The house is owned by one James A. Baker, whose mailing address, for property tax purposes, is listed as P.O. Box 1911, Cleveland, OH 44106. He purchased the house for $17,000 in 2004. Mr. Baker does not appear to own any other property in Cuyahoga County. It is not known what Mr. Baker intends to do with the property. This is the best frame Italianate I've yet seen in Cleveland. While it needs paint, and probably a new roof, it seems to be in quite salvagable condition. There is absolutely no reason for this house to be allowed to decay further. It will remain on my radar, and hopefully yours.